“Mai” has supported Samsan to fight with full performance. Sommai Sakulmateta has confirmed about the final day to let the teamwork of Palangmai Group and he to come to send the encouragement for Srimeungphai (Samsan) S. Somphong without worrying for sure.Sommai Sakulmateta or the head of Phalangmai boxing camp said after Srimeungphai (Samsan) S. Somphong has knocked Phakhao Dabphong 191 in 5th Weber Tukkae of Suek Chao Muai Thai on the last match. Additionally, he has congratulated to the head of the boxing camp of Samsan or Srimeungphai. Thus, the teamwork of Palangmai group and he might come to send the encouragement to him of course. Sommai said that this boxer is under his boxing camp , so he has congratulated with him already. Then, on the final day the teamwork of Palangmai group and he have come to send the encouragement for Srimeungphai (Samsan) S. Somphong of course without worrying. Then, he has his good encouragement to cheer up for the first champion in his life of the countryside boxer , and it might be his honor to create the great history for them. Therefore, it should send this boxing round boxer to grasp for the champion. This entry was posted in Uncategorized and tagged camp, muay thai, Samsan, Suek Chao Muai Thai, thailand, training on 2015/10/29 by muay thai fighter. It has believed in “Phetsongphak” to show the good performance. Mit Nakorn or Sumate Siesattabongkot or the excellent promoter at Rachadamnern boxing stadium has confirmed that Phetsongphak W. Sangphraphai has his good opportunity to become the leading boxer of Thailand. Besides, lately he has performed the good form to overcome Phetsaharat S. Kerttiwat with funniness on Suek PPTV Superfight on last Sunday. Besides, on Suek Muai Thai PPTV there will be Phetsongphak W. Sangphraphai ,who might come replace of the old one and he has bargained the weight for Phetsaharat in 2 pounds. Then, with his good performance he can win his couple one in excellent way until Sumate Siasattabongkot or the promoter has come to praise him by believing that he might become to be the leading boxer in the future surely. Therefore, it should praise for Phetsongphak or the boxer who has his good performance to develop himself continuously. Besides, he has showed his good performance continuously without making disappointment to anyone. However, on the last match of Muai Thai Superfight broadcasted on PPTV although he has fought in 121 pounds by bargaining weight for 2 pounds , he can become the champion with his good strength to be the leading boxer of Thailand surely. 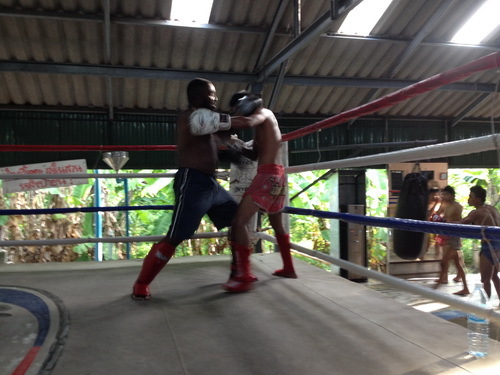 This entry was posted in Uncategorized and tagged camp, muay thai, Phetsongphak, Rachadamnern, thailand, training on 2015/10/19 by muay thai fighter. Muay Thai is the national sport of Thailand. This sport has a long history and originates from the deep jungles of Thailand where Thai warriors and common people had to be involved in a training process in order to learn how to protect themselves from the frequent attacks of the neighboring nations. Back then, this was a discipline that allowed them to defend and attack opponents. As the situation got calmer, Muay Thai was transformed from a martial to a modern sport with clear rules. Today Muay Thai is praised by both natives and foreigners because many people have found out that Muay Thai is a great fitness activity too. In other words, you don’t need to posses competitive aspirations in order to reap the benefits of this sport. You can simply train hard and improve your overall health. There are many people from foreign countries that travel to Thailand because they know that the training classes they will get there are the best. In addition, Thailand is a great travel destination with natural attractions like beaches, jungles etc. Those who travel to Thailand for this purpose, join Muay Thai training camps where they take lessons from professional trainers. Every camp has different programs that are based on student’s goals and physical abilities. For example, there are classes for women and men. There are also classes for those who want to speed up their loss weight plans and classes for people who just want to sculpt their body. No matter what kind of program you choose, you can rest assured that after a few classes you will feel much better and more energetic. The reason for this is very simple – Muay Thai training stimulates all the muscles and tissues in the body and activates the good hormones. Muay Thai training will not only improve your physical health and appearance, but it will also make you feel much better and more confident. In addition, this specific type of training will teach you how to defend yourself from unprovoked attacks. Muay Thai training is a very useful type of training and the best place to learn more about it is Thailand. This entry was posted in Uncategorized on 2015/10/13 by muay thai fighter. “Mangkornphet” is supported by ”Boat” fully. Currently, Yochi or Suphasate Kertniwat has accepted that now he has made a decision to send Mangkornphet S. Kertniwat to practice at Phetyindee Academy after fighting on the last match. In addition, Nong Boat has given the participation well in order to watch Mangkornphet to pass into the Semi Final round. Thus, it has brought the good trainer or Srikhun Narachawat to be helped fully , so the boxing fanclub feel comfortable without worrying. Besides, recently Yochi or Suphachate Kertniwat or the big boss of S. Kertniwat boxing camp has revealed his mind to accept that in the past he sent Mangkornphet S. Kertniwat to fight on Isuzu program for the first round following by the second round or Uaisaopor Sujibameekaew on Suek Chao Muai Thai of last Saturday of 19th September 2015 at Siam Omnoi boxing stadium. In addition, now Mangkornphet has been practiced at Phetyindee Academy after fighting on the last match with good participation of Boat. What’s more, Mangkornphet has passed into the Semi Final round by having the good trainer or Srikhun Na Rachawat , who has made the good name of Phetmorakot W. Sangphraphai until being the champion. Thus, the boxing fanclub should feel comfortable without worrying. The big boss of S. Kertniwat said that after he has lost the game on the last match , he has practiced at Phetyindee boxing camp. Besides, Nong Boat has given the kindness , and sent the good performance trainer or Srikhun ,who made the good name of Phetmorakot to help Mangkornphet until he isn’t failed on the match. Therefore, this match is the significant one , so he should win the game only in order to be cheered up on the next final match. This entry was posted in Uncategorized and tagged camp, Mangkornphet, muay thai, Phetyindee, thailand, training on 2015/10/09 by muay thai fighter.